Like my heroine, Pippa Dunn, I have found home made marmalade on toast and a cup of tea to be the perfect repast when I am wide awake in the middle of the English night after a long flight from America. Here’s a passage taken from Chapter 45 of The English American, when my heroine Pippa leaves the chaos of her life in New York and comes home to visit her parents for a week. Although for Pippa, everything has changed, for her English parents, who live in a house built in 1470 near the town of Peaseminster, life goes on much as before. Thanks to jet lag, I’m awake at four o’clock in the morning, so I go downstairs to make myself some more toast and a cup of tea. Boris is lying in his dog basket under the kitchen table, but gets up, tail beating against the kitchen floor as I feed him some of my toast and Dad’s homemade marmalade. The pink and yellow pottery mugs from Greece are still hanging from the hooks under the kitchen cabinet next to the window. The tartan drying-up cloth is still folded over the rail by the sink. The white electric kettle is still in the same place, next to the tin of Earl Grey tea. The yellow ceramic pot with SUGAR written on it is still next to the slightly larger pot with FLOUR written on it in the same lettering. Mum’s new Too Hot to Handel oven gloves are hanging where her blue and white checked ones used to hang, on the hook next to the oven. The plastic rotary in the cupboard is still home to the salt and pepper holders, the Ryvita, the marmalade, the honey, and probably the same jar of Marmite I ate from before I went to America. Yes. Everything is still here. Reassured, I kiss Boris good night and head back upstairs to my room. You can find instructions on how to make a cup of tea on page 95 of The English American – or better still, you can use this recipe from The Ritz Hotel in London. I would be thrilled to hear from book club members who find themselves chatting about my book over a pot tea, served with marmalade on toast!! This recipe was inspired by Helen Simpson’s recipe for tea in The London Ritz Book of Afternoon Tea (William Morrow, 1986). Dole out one heaped teaspoon of tea leaves – Earl Grey, Lapsang, Assam, Ceylon, Jasmine or Darjeeling – one for each person and one for the pot, straight into the warmed teapot. The kettle will have reached a galloping boil by this time, so pour the water over the tea. Take care that the water is not long boiling; over boiled water results in a bitter muddy brew of tea. Allow the tea to stand and brew for anything from three to six minutes. Give the tea a good stir and pour it, using a strainer to catch leaves. 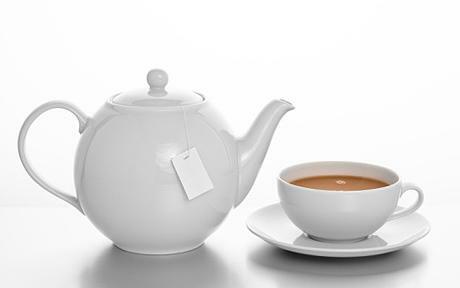 If you take your tea with milk, you should add it to the cup, cold and fresh, before pouring the tea. Toast is toast is toast. Although I prefer thin toast. And if you’re making toast and marmalade, do be sure to put a little butter or margarine on first. 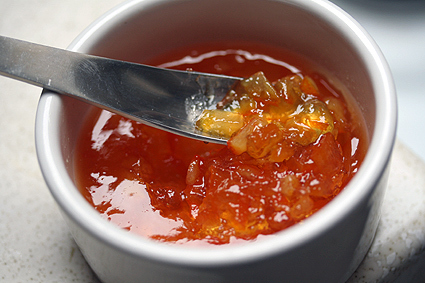 Here’s my Dad’s recipe for homemade marmalade. Rinse oranges under hot water. Quarter lengthwise, and slice crosswise as thinly as possible. Place orange slices, orange juice, lemon juice and 6 cups of water in a large saucepan over medium high heat. Bring mixture to a boil, reduce heat and simmer until orange peels are translucent and tender, about 1 1/2 hours. Add sugar and return to a boil, stirring constantly until sugar is dissolved. Continue cooking, skimming foam off the surface and stirring frequently for approximately half an hour. For your book club: Marie Taluba created this English Americancrossword puzzle for her Hunterdon County, New Jersey book club. Enjoy!